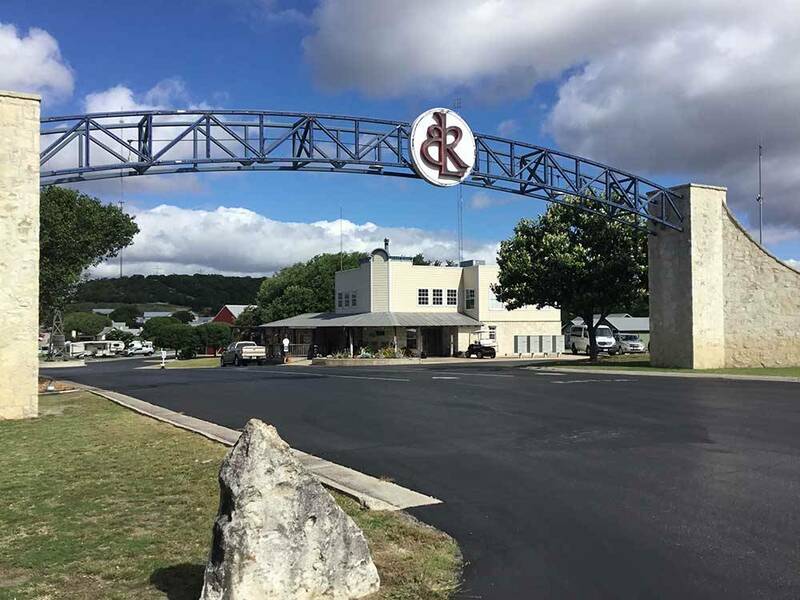 Buckhorn Lake Resort is the perfect place to stay while exploring the Texas Hill Country. We're just a short drive to many charming towns including Fredericksburg, Bandera, Boerne, Luckenbach and San Antonio. Overall, Buckhorn is a nice park, but the owner needs a couple classes on how to treat their customers when a problem/issue is brought to their attention. While at the resort their lawn crew were weed whacking the sites. During our sites time their worker had the weed wacker going full speed and began peppering our coach. I asked the worker to stop and then I went to explain to the owner. In short, after explaining the issue and also hearing the same thing from his foreman the owner told me if I didn’t like the way things were done that I should go somewhere else. Not very nice customer service. Buckhorn Lake Resort is a nice facility and offers different accommodations. There is an exclusive owners' only section in the back, a lakeside section with an adults only pool and the front section which is near I-10. We called in a reservation for the night on our way east into Texas. When we arrived, we realized they were going to put in the front section. We were concerned about the highway noise and had them move us to the lakeside section, which was an additional $5 per night. The site was good. Pressed gravel that was very level and with ample space to pull all our slides out. The sites are set up in alternating directions, so your rig shares a picnic area with the next rig rather than staring at their hookup area. It was a nice setup. Our site was on a loop and the turn was so tight we had to unhook our tow and backup to get into the pull-through site. Fortunately there was an empty site that allowed us to do that. Given that they claim to be set up for big rigs, I was surprised by the tight turn. Overall, we had a nice quiet stay with no other issues. We have stayed at this park numerous times in the past. We booked a site for 2 nights on our way to west Texas. We checked in, got our site (6097) and set up. This was on a Friday late afternoon. Everything was working fine until about 7 pm and we lost power to most of the coach. We tried to figure out what the problem was and thinking we had a major electrical problem we decided not to continue our trip to west Texas where RV services are very sparse. On Saturday morning we headed back home. By the time we got back (running the generator most of the time to charge up the batteries) everything seemed to be working fine. So we determined that it probably was not our coach, but the park. I called the park on Sunday to inform them of the problem and that they may have a problem at site 6097. They were going to send someone to check it out and thanked me. I asked for a refund for at least one night, since we'd driven 4.5 hours to get there and 4.5 hours to get back home. They said they would have a manager call me the next day. To date, I have heard nothing from Buckhorn. We are very disappointed in their response in this matter. Will not be staying there again. I know we're just a little fish in the big pond but customer service means something to me. The park itself is beautiful and well kept. Staff was super friendly and helpful. Spaces were ample size for our large 5th wheel. Only two drawbacks...you are literally about 1/4 mile away from I-10...so the road noise and 18 wheelers using engine brakes is literally non stop day and night. Second, we were on the far south row of parking. We were told our spot would back up to a meadow where we would most likely see lots of deer. Our spot backed up to a large maintenance shed with no view at all. If you can stay on the far north side of the park, the road noise might not bother you and your view will most likely be better. Do not stay on the south side of the park if you're wanting a nice view or quiet. 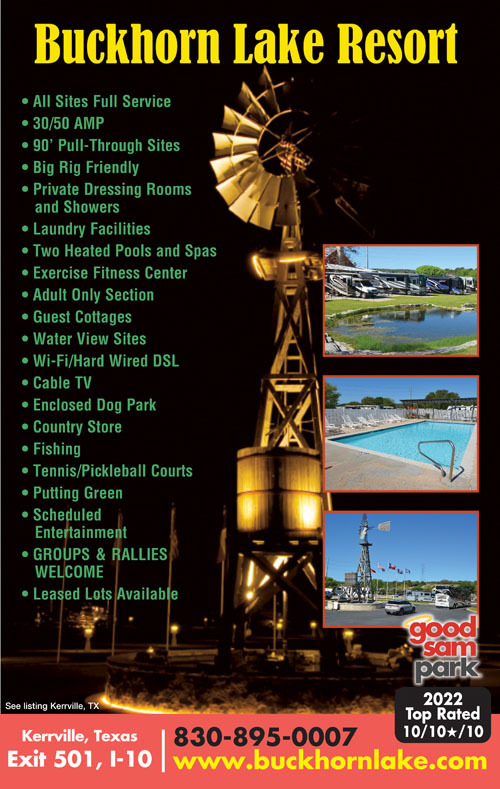 This resort sets the standard of excellence for RV parks. Friendly, helpful staff. Concrete sites are level and even. Utility post at mid-site. Not able to access WiFi - lots of users - but hotspot worked fine. Excellent dog park. Easy drive to shopping and restaurants. Close to I-10 so some traffic noise. This is a wonderful RV park. The reservation system is a little difficult when trying to get parties together or very close to each other. It was a hassle to have to pack up every day to go to our friends sites. Decent place, beautiful sites, helpful staff. I would have rated it a 5....however, with a site that has "Lake" in its name, one would expect a lake, would one not? No lake. There was a small muddy pond, though. Also, it is WELL within earshot of Interstate 10. Not a plus. The Best Park in Texas - Awesome! This is usually an overnight stay for us - would love to stay longer and visit Kerrville. Great place - all concrete pads - level - office staff is excellent - nice little store to buy essentials. Beautiful, peaceful setting. Thanks to all for such a great place to park. Bathrooms were excellent. Park excellent shape. Pull in sites cement pads. Water, elect, and sewer connections excellent. Wide RV spacing. Very nice pool. Staff was courteous, friendly, and knowledgeable.